While many people have heard of ransomware, many don’t consider it to be a grave threat to their personal and financial security. However, ransomware is a serious problem that has ruined individuals’ lives and destroyed entire companies, and this threat is growing. Though the precursors of ransomware were developed by elite American computer programmers at the end of the twentieth century to protect people from malicious software, ransomware schemes are being developed by novice programmers who have exploited millions of dollars from people, collectively. In addition to the financial costs, ransomware attacks have resulted in companies losing years’ worth of incalculable amounts of data resulting in businesses becoming crippled. Further, starting around 2012, ransomware scams have become an international phenomenon and have recently been categorized by Symantec as the leading threat to cybersecurity. For those reasons, shielding yourself and your business from a ransomware attack isn’t optional. Unfortunately, getting certain forms of protection may not be cheap. Even if you purchase the right kind of software to protect against a ransomware attack, that software on its own isn’t foolproof. So, you should invest in a few easy to use strategies to protect yourself. While potentially anyone is a target, certain companies and individuals are more prone to be targeted by ransomware. Besides government agencies, ransomware attackers generally focus on organizations that require constant access to data and cannot afford their network to be down for more than a few hours. For example, companies that do work in the financial services sector, airlines, and private companies that provide utility services are particularly susceptible. A common tactic used by ransomware attackers is to prevent the victim from gaining access to their own data and leverage this to coerce money from them. An easy way to mitigate the damage of this tactic is to set up operational protocols on your firm, so all files are backed up consistently and often. 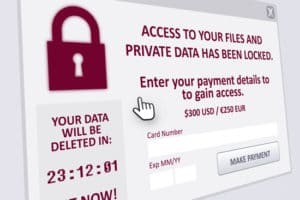 Keep in mind, though, that more sophisticated ransomware attackers will try to root out and block access to any backup systems, so it’s a good idea to transfer all of your backup data to servers or external storage devices that are not connected to your network and don’t have online access. By whitelisting applications and keeping them updated, it’s far less likely that you’ll pick up a nasty piece of software. Your whitelisted software will update automatically, and you’ll be able to spot suspicious programs that are supposedly native to your system and require permission to install an upgrade. Often, these fishy software updates are malicious software, trying to infect your computer. While this should be obvious, don’t download attachments from email senders that you don’t recognize and generally be careful what you download. If you do end up with a ransomware infection, it is vital not to panic. Instead, disconnect your system from the internet, shut down your network, and contact an expert. If you act quickly enough, you may mitigate some of the data you lose access to. If your data is lost, experts recommend not paying the ransom even though it seems like the pragmatic thing to do. Conceding to the ransomware attacker only empowers them and there are examples of people still losing their data even after paying what their attacker demanded. On a positive note, remember that not all ransomware infections are like the WannaCry virus; it is possible to recover your system depending on the infection that you have. In addition to understanding computer and network security, we are also a leader in cloud-based networking. We specialize in helping companies migrate to Office 365 cloud system. In addition to modernizing your network, we’ll apply our expertise to keep your applications, data, and other sensitive data secure from those who might attempt to take your information safe. For more details or to get our top tier services, contact us today.